It's time for a cosmopolitan night! Join us on Friday, 15 February, in Hilton Quarterdeck Bar in Hilton Malta - one of the most luxurious and exclusive hotels of Malta! Let's Mingle and Dance in Hilton Quarterdeck Bar! The venue has booked exclusively an area for the InterNations members! 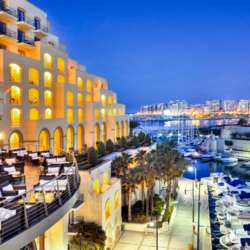 Quarterdeck Bar is located in Hilton Malta(Portomaso area-St.Julians). A welcome drink (1 glass of wine or beer or soft drink) will be offered to each attendee. As always, our Albatross Members enjoy free entry to the event! Let's enjoy a wonderful evening in one of the most cosmopolitan hotels of Malta!